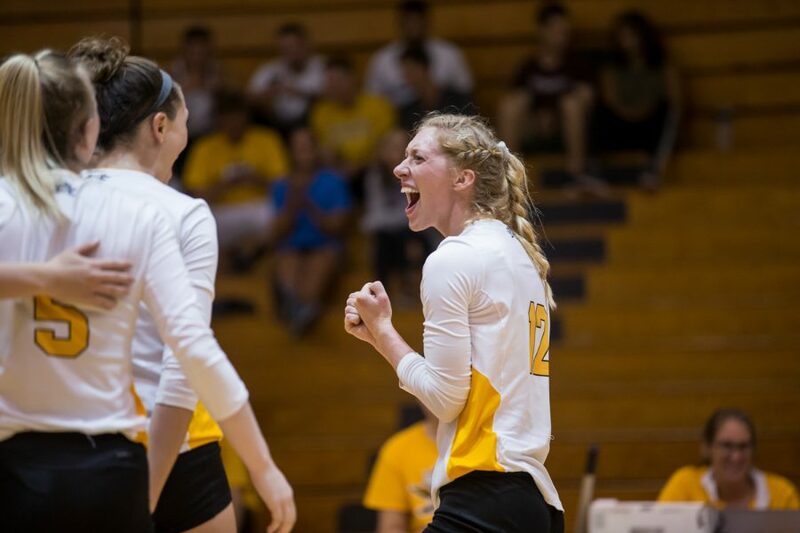 The NKU women’s volleyball team won a five-set thriller (25-21, 21-25, 22-25, 25-14, 15-9) over Wright State in the Horizon League Volleyball Championship Tournament quarterfinals on Friday afternoon. The victory places the Norse in the HLVC semifinals against the no. 2 seed Cleveland State Vikings tomorrow evening at 7:00 p.m. on ESPN+. Laura Crawford tied her season high in kills with 14 terminations to lead the Norse offensively, while First Team All-Horizon selection Haley Libs recorded her 23rd double-double with 10 kills and 20 digs. All-Freshman Team honorees Anna Brinkmann and Miranda Wucherer each contributed double-digit digs (10/12), while Shelby Olsen handed out 26 assists. The Norse took advantage of the Raiders mishaps in the first set and gained a 20-10 lead in the early goings. Though the Raiders would come back on a 7-0 run, the Norse proved to be too much as Bailey Western gained two kills before an ace from Brinkmann finished the set. The Norse continued their momentum from the first set and gained the advantage early on, but the Raiders were able to play catch up and take the lead, 19-18. From there, the Raiders had the advantage and finished the set after several kills and a pair of blocks. Offensively, the Norse underperformed compared to the Raiders. Both Wucherer and Natalie Hardig led the Norse offensively with three kills, while Ashton Terrill led the defense with eight digs and an ace. The third set was a highly offensive one for both teams, as they collectively earned 32 kills compared to 28 digs. The Raiders took the third set as they finished strong with a kill and a block. Libs led the Norse offensenly with five kills, followed by Western with four. The Norse started the fourth set with two kills and a stuff block from Crawford in the first three points. The Norse would continue to dominate the match and held the Raiders under .100 to pick up the victory, 25-14. Libs and Terrill led the Norse defensively with a combined 13 digs. Both teams were neck-and-neck to start the final set, until Brinkmann went on a serving run at the 6-6 mark to put the Norse ahead, 10-6. From there, the Norse maintained a comfortable lead until Libs brought them to set point and Hardig tallied the final kill to end the Raiders season.